Maybe you’re already familiar with topographic maps or topo maps for short. Maybe you’ve seen them with all their squiggly little lines and decided that they were too difficult to decipher. Or maybe you have no idea what I’m talking about. No matter which of the above scenario’s describe’s you, this post is going to help you learn, or enhance your own map reading skills. By the time we’re done, you’ll discover that reading a topographic map isn’t all that difficult. And even if you already know that, you may learn something about topo maps that you didn’t know before. Either way, if you’ve read this introductory post on compass use, you’ll be ready to learn how to use a compass and a map together and expand your navigational skills far beyond where they once were. Hold on! 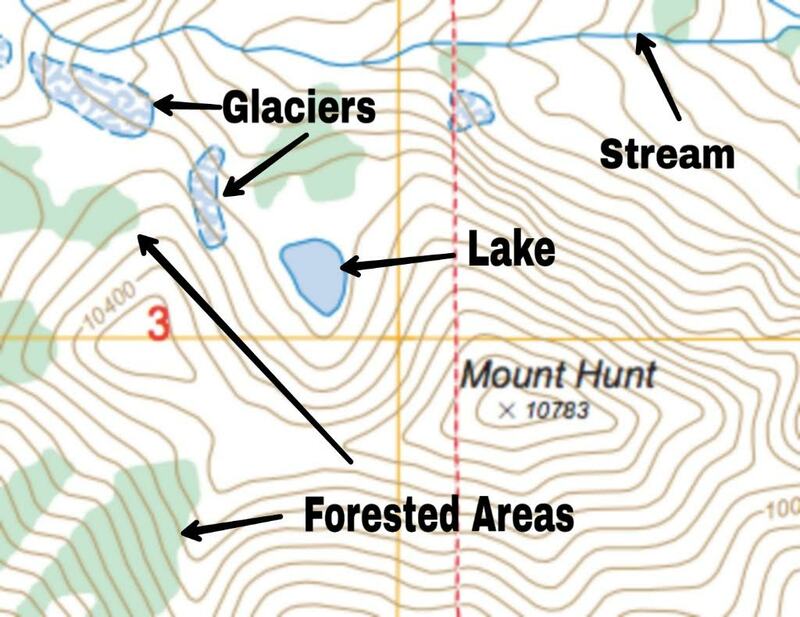 What is a topo map? Don’t worry I’m going to explain before we jump into things. A topographic map is a representation of part of the earth, showing both man-made and natural features like rivers and lakes. And is characterized by contour lines to show elevation or the shape of the earth’s surface. In other words, a topo map is an accurate way to project our three-dimensional earth onto a flat surface. Take a look at google maps for a second. Google maps is not a topographic map, so if you type in an address you’ve never been to, there’s no way to tell if it’s on a hill, in a valley, or halfway up a mountain. Google maps do a great job of representing roads and buildings, and it even shows river’s, lakes, and mountainous/ forested areas represented by large green blobs. But it is definitely not geared toward backcountry travel. Imagine you are heading to a campsite in the mountains, you know which direction you need to go, so you set your compass and start following your bearing straight toward your destination. Then, you walk straight off a cliff. OK, hopefully, you won’t be so focused on your compass that you walk off a cliff without noticing it, but if you are relying solely on a compass or a GPS to navigate, you may find yourself trapped on one side of a canyon without knowing how to get to your destination. This is where a topographic map can help you. You can look at a topo map and see exactly where the canyon is, where the mountains are and even how steep the slope will be. I used to work as a US Forest Service technician checking goshawk nests 1 to see if they were in active use, that is, to see if a bird was currently raising chicks in the nest. My crew had locations of all the known nests and previously active territories, and it was our job to visit each location throughout the summer. The goal was to drive as close to the nest location as possible and then get out and walk the rest of the way. I was navigating one day and neglected to look at the topographic map. We drove for about a 1/2 hour up a ridiculously, rough dirt road to the point closest to the nest, only to find that it was just about a sheer drop off to the nest location. We had to backtrack to a different road and wasted about an hour of time. Imagine if, instead of driving, we’re backpacking, and spend all day hiking to that point. Now, it’s getting dark and we have to figure out a way around or down the precarious slope. You can see how this could easily lead to some less than ideal situations. Many types of topo maps exist, but a good Two Foot Traveller will use a 7.5-minute topographic map, also known as a quadrangle or quad, if possible. Here is what you can expect to find on your quad. This is located on the top right corner of the map. Probably the most important and useful feature of a topographic map! Contours are imaginary lines that represent points of equal elevation on the surface of the earth. 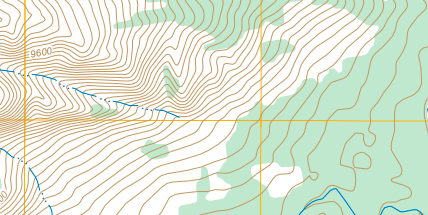 If you walked along one of these contour lines, you would go neither uphill nor downhill. The difference in elevation between two contour lines is called the contour interval and is often listed below the map scale. On many maps, every 5th contour is a little thicker and is called an index line, somewhere along the line, you will find the elevation listed. This map does not have thicker index lines but you can still see the elevation on some contours. See where it says 9600 above? Every point along that line is 9600 feet above sea level. When contour lines are close together we know that the elevation is changing quickly in a short distance, so the land is very steep there, as you can see in the upper left region of the map snippet. The lower right region’s contours are spaced much farther apart, so the land is much flatter in that area. As you come to understand contour lines you can begin to visualize what the land actually looks like. See the circles begin to converge on the map snippet above? This indicates a mountain peak! Can you visualize buck mountain as if you were looking down on it from above? You can see how steep the terrain is as you approach the peak, and you can see it begin to level off in some areas further away from the peak! 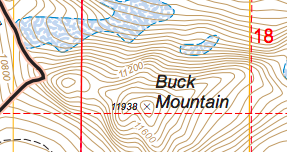 In this map snippet, you can see natural features as well as the name of a mountain peak, ‘Mount Hunt.’ You may also see the names of canyons, mesas, arches or any other geographic features on your topo map. Features are important to help you match up your map with real life. You can use prominent feature as handrails and backstops, to keep you on course and to help you know if you’ve gone too far along your route. Let’s look at some examples from the map above. You’re at the top of Mount Hunt and you want to head to the little lake to the Northwest. If you run into the stream, then you’ll know you’ve gone too far. The stream is the backstop, if you reach it, you know you need to look at your map again and figure out how to backtrack to get to where you really want to go. On the other hand, if you know you want to head west further up the valley, the stream becomes your handrail! You can follow it to keep yourself on course. Canyon’s, ridges, and hillside’s also make great handrails. You can use checkpoints, like a stream branching off from the main channel, along with your handrails to constantly orient yourself and know where you are on the map. The Legend will be at the bottom of the map and includes a lot of relevant and useful information such as the following. A 7.5-minute topo has a scale of 1:24,000. This means that one inch on the map is equal to 24,000 inches, or 2000 feet, in the real world. You will find the scale at the bottom center of the quadrangle. This is very useful and allows you to measure distances on the map and convert them to actual distances in the real world! The smaller the scale the greater the level of detail the map will show, but the smaller the area the map will cover. Larger scales mean that the map can cover a larger area. A scale of 1:24000 is a great compromise between detail and map size! You can use a string to easily measure distances on the map. Check out the video below to see how. 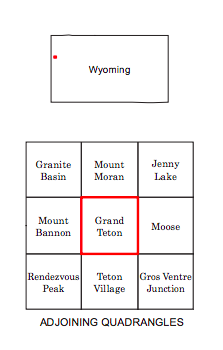 The top square shows where this map is located within the state of Wyoming. The bottom squares show where this quadrangle is in relation to all the bordering quadrangles. So if your planned route begins on this map but extends onto another, you’ll know which other quadrangle(s) you need to take with you. 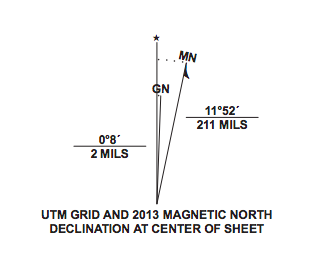 This map shows that magnetic north in this area was 11.52 degrees east of true north as of 2013. To learn more about declination click here. 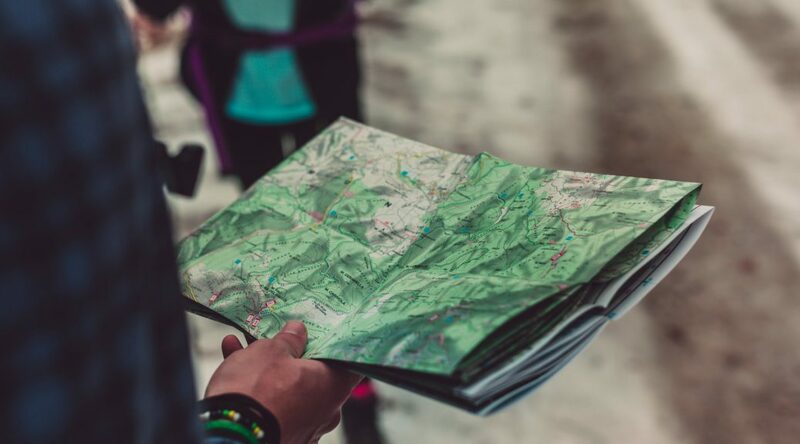 You can practice reading topo maps by bringing them on day hikes with clearly marked trails, or off-trail in areas that are very familiar to you, before moving into unfamiliar areas. Try to visualize your route before you go, and check your map along the way to see how the features on the map match up with real life! Practice measuring distances along your route, and using backstops to make sure you haven’t gone too far. When you’re confident with both you’re topo-reading and field bearing skills, you’re ready to move on to the final step in becoming an expert backcountry navigator. Stay tuned for the final post in this navigational series, where you’ll learn how to combine compass and map-skills into a navigational superpower. Are you already a topo expert? Leave us your personal tips in the comments below! A goshawk is a large, aggressive, bird of prey that nests and hunts in forests across the US. I wonder a lot these days if the millennials could still find their way around without Siri and Bixby and GPS. When I was a kid, we still had to break out the old road map when we were on the road sometimes. I think this article might seem “old school” but the truth is there are probably a lot of people out there that need this primer on how to make it when technology fails. We all hear about these EMP strikes where the infrastructure is knocked out. It’s scary but we might have to go back to this one day. Technology already fails every day. I hear about people getting lost in the wilderness with their GPS units and cell phones and still need a search and rescue team to come and save them. I am so glad I have come across your website. My husband and I have had many discussions about my skills (or lack of) in map reading. Gosh, you’ve explained this so well. We do a fair bit of day hiking, and I’m so not confident with maps. Thank you for sharing here. I’m definitely coming back to this page, before we set off into the wilderness and will read over your article on “How to Read a Topographic Map’. Perfect, thank you so much! I’m glad I could help! I think your confidence will grow as you start to practice with the map. If you haven’t already check out this article on how to use a magnetic compass, and then stay tuned for a post on how to use a compass with a map, that will tie everything together! You’ll be able to navigate like a pro! Great info. I am scared of Topographic maps because they are a bit complicated but I have to admit you are so thorough in your explanation. I now can clearly understand what every contour line means. But my problem may come when I want to use the map practically. Again the issue of direction always is a big problem, I really don’t know how a compass can be used. I think I may need someone who can teach practically. Thank you so much for a well explained informative article. 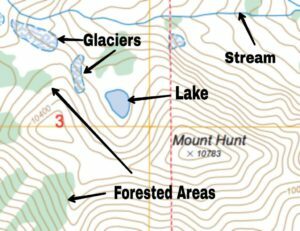 It is a little intimidating at first, that’s why I recommend practicing with a topo map in an area that is familiar to you, or on a clearly marked trail. That way you can get the hang of it before you’re in any danger of getting lost. Check out this article for an intro on compass navigation. I am planning on adding a video soon to better explain the concepts. I often use a GPS and topographic map together, with a compass for backup. I think you could surpass your limits if you gave it a try! Its quite amazing what you can find on the internet. This kind of knowledge is exactly what I need. We do a lot of camping and sometimes have some issues getting to where we need to be. Im going to look a bit more into this and see where it gets us. Hopefully not as lost as does happen sometimes. I do have a question? Can this information be put to use when trying to figure out the landscapes of water bodies? I ask this because I do a lot of fishing and knowing where drop off and such are. Thanks for this info and I will be watching for your answer. Yes! The same principle of contour lines can apply to underwater landscapes. They are called bathymetric maps. I myself do not have any bathymetric experience but I believe they work in the same way and show depth instead of elevation. It seems as technology grows people’s basic skills drop at basic things like …reading a map! So thank you for your informative article giving hope and a much needed life saving and timesaving skill that everyone needs. I actually came across this whilst looking for a tutorial to utilize with my children. We homeschool and are exploring maps this week as I want to make sure to pass this skill along. We never know when technology may go down and we need to rely on tried and true ways of navigation. Next lesson…sailors navigation. Navigation with the stars! It’s so true! Technology fails all the time already, GPS units need batteries and rely on communication with satellites and if that connection fails for any reason (like too many clouds in the sky) and you don’t know how to use a map or a compass then you’re out of luck! It’s so cool that you’re teaching your kids about navigation! I think there are so many interesting things to learn about it! Interesting! Ive heard of Topo maps although have never used one. I have used physical maps which aren’t as intimidating as Topo maps. I do appreciate how clear and concise your descriptions are of it’s use. You made it sound like I could pick one up and know how to use it – even though I can be directionally challenged at time lol. The great thing is that no matter how directionally challenged you are, you can use the features on the map to match up to real life and know which direction you need to go. I will be writing a third post about how to use a compass with the map to orient it in the correct direction. Once you know how to do that, you could be the most directionally challenged person in the world and it wouldn’t matter because the compass knows the directions for you! That’s great! I’ll have to keep an eye out for your following post! Frankly I had no idea of topographic maps, but its really interesting to know that Google maps are not topographic maps, since it does not show any clue about where the location is and there’s no way to tell if it’s on a hill, in a valley, or halfway up a mountain. Really nice to know about contour lines and other features on it. But can you please explain how far apart contour lines are? and how do you determine what the contour interval is when looking at a map? How far apart the contour lines are, the contour interval, is different for every map. If you’re in a very mountainous area it may be 100 feet, if you’re in a flatter area it will probably be a lot less. Usually the contour interval is written somewhere in the map legend, probably below the scale. If it’s not in the legend you can always find out the contour interval by looking at the index lines. The exact elevation is written somewhere along the index line, so if you want to know the interval you can find two index lines and subtract to find the difference, then divide by the number of lines in between. Your style of writing is very friendly and easy to relate to. Although topography sounds intimidating, you take the fear out of it and explain it very well through your use of text, topography map examples and diagrams. The video is a very nice touch. I did not know what declination was until I read your description and looked at your diagram. It is really cool to see the responses of people you have helped. I’m impressed with how clear you can explain the process. Thanks for writing this and for responding to each question.